Use on Citrus, Fruits, Vegetables & Lawns, Ornamental Trees, Shrubs & Flowers. User Friendly. No Guesswork. 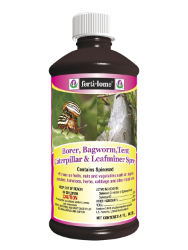 Kills Leafminers, Borers, Leaf Rollers, Thrips, Worms (Caterpillars), Colorado Potato Beetle and other listed insects on Vegetables, Fruit and Citrus. Kills Armyworms, Sod Webworms, Cat Flies, Loopers, Bagworms, Tent Caterpillars and other listed insects on Lawns and Ornamental Trees, Shrubs and Flowers.